Personal Hand-made gifts for every occasion. 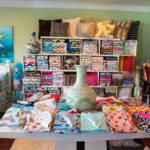 Our vast selection of beautiful hand-made blankets, scarves, and pillow covers make Baby Jade your trusted source for one of a kind gifts throughout the year. Whether it’s for a baby shower, a house warming gift, a birthday, or “just because”, check out our product sections and gift sets for great gift ideas. A gift from Baby Jade will bring lasting happiness and comfort. Your Baby Jade gift is sure to impress! Let us help you select the perfect hand-made gifts for your VIP customers, employees, vendors and more. Quick shipment on all orders & volume discounts will apply. Your gift recipients will thank you long after they have received their gift from you. Let us make “giving” simple and easy for you, as that’s what we do best. Personalized service and advice with each order. “Bottom line” you will be thanked and thought of long after your gift has been given. Call us now at (323-284-4649) or email us at info@babyjadeusa.com to setup your order or request additional information.